Do you ever wonder ‘How often should I give my dog a bath? Veterinarians and experienced owners alike, advise you not to bathe your best friend too often. 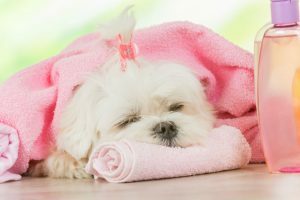 Some important factors to consider when shampooing a dog include the following. Frequent bathing can result dry skin, because it depletes the essential oils needed to keep the skin moisturized. This could result in excessive scratching, redness and inflammation. The frequency of bathing your dog depends on the breed and your dogs’ activity level. If your dog is outside alot or playing in the dirt, you will have to bath them more often. Double coated dogs or dogs with an undercoat should be shampooed only three to four times a year. 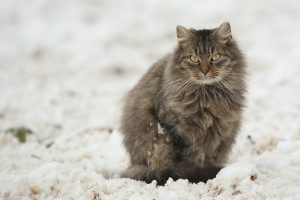 Due to their heavy and thick fur, the entrapped moisture may become a hotspot or a breeding ground for fleas and ticks. 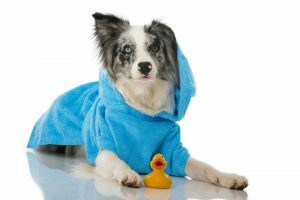 If you and your pooch live in a cold area, your dog should not be bathed too often as this may lead to their coat becoming soft and less fluffy thereby, losing their ability to retain heat. During the cold season your dogs’ skin and coat can become dry, so it is important to use a moisturizing product such as Perfect Coat Ultra Moisturizing Dog Shampoo during the winter months. At the beginning of the summer season, comb out your dogs fur with a shedding tool specially made to remove your pets winter coat so fido won’t overheat. If you are planning to give your puppy a warm bath, do keep in mind that it is not eligible for a dip until five weeks old. In the meantime, a sponge bath can remove any dirt and grime that your puppy has gotten into. One of the most important details to keep in mind while bathing your dog is to choose the right shampoo. Some of the popular products available for your canine buddy are Burt’s Bees for Dogs All Natural Oatmeal Shampoo and Nootie Oatmeal Dog Shampoo with Soothing Aloe. Adams is capable of removing dirt, and dander. The additive PRECOR Insect Growth Regulator kills the adult fleas thereby hindering the life cycle of the same for the next 28 days. Also, is best to use the shampoo only within 18 months after the date of packaging. Does your dog have a thick coat? If you can’t easily see their skin through their coat or can see that there is another, undercoat layer, underneath the top layer of hair then your dog has a thick coat. You would need to purchase a shampoo such as Foam Care by Vetericyn that is specifically designed to work with thick coats. Also learn techniques to help penetrate the undercoat and give your dog a full bath. Your thin coated dogs skin is more exposed to the elements such as wind, water, sun cold and heat and requires a specially formulated shampoo to condition the skin. A hypoallergenic oatmeal based shampoo should do the trick, such as Pro Pet Works. A moisturizing pet shampoo such as this Natural Pet Shampoo can control and soothe irritable skin. Bonus: you can use it on your cat too! Some dog shampoos can kill lice and prevent them from coming back. Read the bottle of shampoo carefully, some will state it right on the bottle and also list active ingredients like lime sulfur, pyrethroid, and pyrethrin. 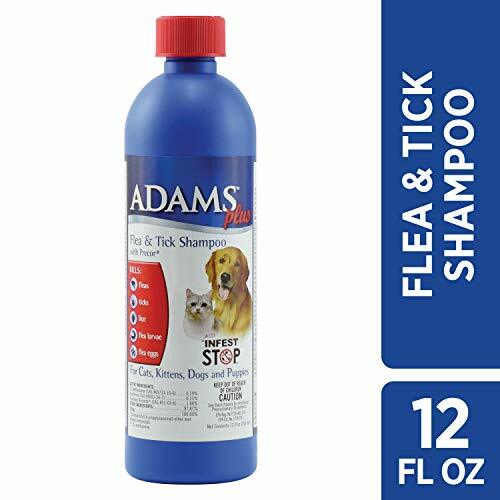 Make sure that the shampoo you purchase is effective at treating lice and still gentle on your dog.Examples of good dog shampoos are Nootie Medicated Dog Shampoo, 4-Legger Certified Organic Dog Shampoo, DakPets Dog Shampoo and Conditioner, and Nootie Oatmeal Dog Shampoo with Soothing Aloe. Read the labels and our reviews to know more about the effectiveness of each dog shampoo. The whole experience can be a smooth ride for both you and your dog, if your dog is slowly introduced to the idea of a bath. For even more tips on grooming and bathing your pets, please download our ebook, From Shabby to Dapper! The first step is to gain your buddy’s trust could be by shaking its paw, caress the ears, and opening the jaw numerous times in a day. Applaud good behavior and consider giving the dog treats that help in reinforcing good behavior. The grooming tools such as the brush, comb etc. should be held close to your dogs nose so they can smell them and get used to them. As the dog becomes more accepting to being groomed, motivated them with treats. Let your dog get familiar with the calm sound of running water, try supplementing the action with tasty treats or verbal praise. If a pet dryer is being considered, then it should be introduced to the dog in a similar manner. Bear in mind that human blow dryers are not recommended. 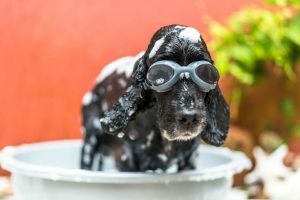 If you are sure that your dog will not enjoy the bathing session, seek out the help of another person to ensure that the experience for your dog remains a positive one. This will help make future grooming sessions more pleasant. Place an anti-skid mat in the tub before filling with lukewarm water up to your dogs knees. 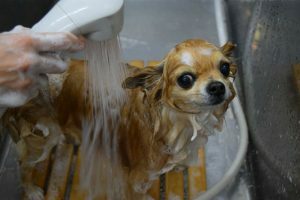 For stabilizing your dog while bathing, do opt for a leash and collar setup and make sure the material is made of nylon. After the tub is made ready, lift your dog and place him in the tub. Make sure while lifting, you don’t hurt the pooch (or your back) so make sure to bend at the knees and ask for help if your dog is heavy (over 50 lbs). Spray the back of your dog and also the shoulders to make him get used to the idea of bathing. Keep the spray set on a low, which will prevent spooking your dog. 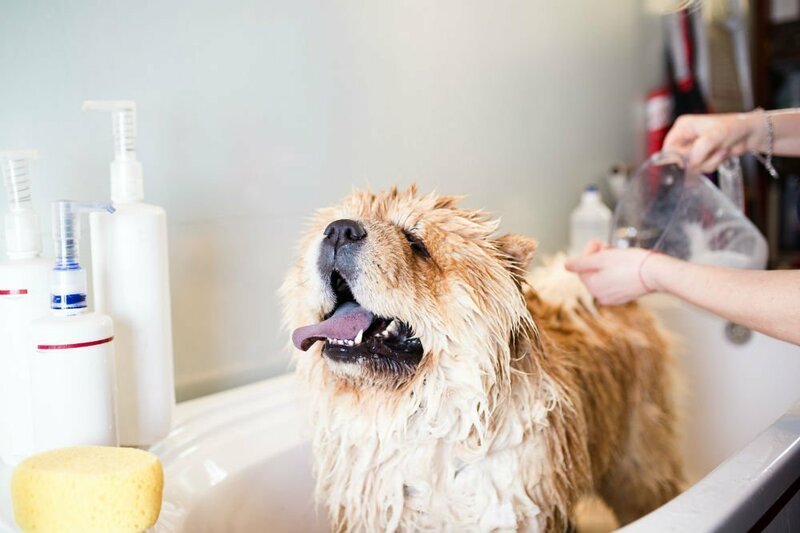 Preventing your dog from becoming scared during bath time will make future bathing and grooming sessions a breeze. While spraying the dog with the shower nozzle try to keep an average distance of about an inch from the dog’s fur. This ensures that the water penetrates the thick coat and reaches the skin. Rub the water in with your hand to ensure that the water gets right down to the skin, especially for dogs with an undercoat. After your dog has settled in, wash their head and avoid spraying directly on the face. Keep the head tilted slightly backwards, so that the water runs downward towards the back of the head. 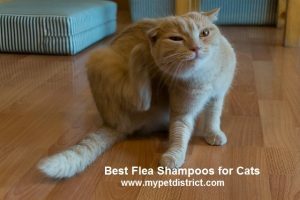 Apply shampoo and gently massage until the product makes a thick lather on the fur. Keep this in mind, for thick haired dogs, it is advised to rub the shampoo for lather formation towards the direction of hair growth. This helps in preventing tangles in the coat during the bath. Use a soft brush to clean any facial wrinkles and around the paws. Don’t forget to clean the ear flaps, under the neck and other tender areas. While cleaning the ears do keep in mind that water should not get inside the ear canal of the dog as it may cause severe infections. During cleaning around the ear, if the dog stands up, cover the ear canal with your hand during the rinsing and washing operations. While cleaning the head, use your hand to cover his eyes so that the soap or shampoo doesn’t get inside his eyes to cause irritation. 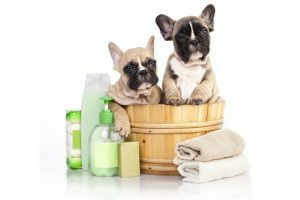 Make sure that no residual soap or shampoo is remaining on your dogs skin and fur otherwise it may lead to skin irritations. After bathing your pet, comes the drying. To properly dry your dog, gently squeeze out the excess water from their fur, using your hands. 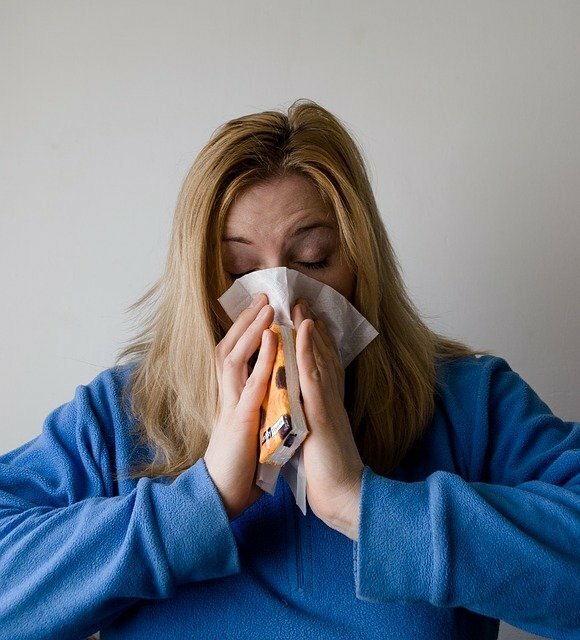 A large absorbent cotton towel should be used to blot out the excess moisture. Don’t rub your dog’s fur as it may cause your dogs coat to tangle. Don’t forget to remove the cotton balls from your dog’s ear canals as trapped moisture may lead to ear infections. Avoid letting your dog out until he or she is completely dry. To increase the gap between each bathing session brush and comb your dog on a regular basis. 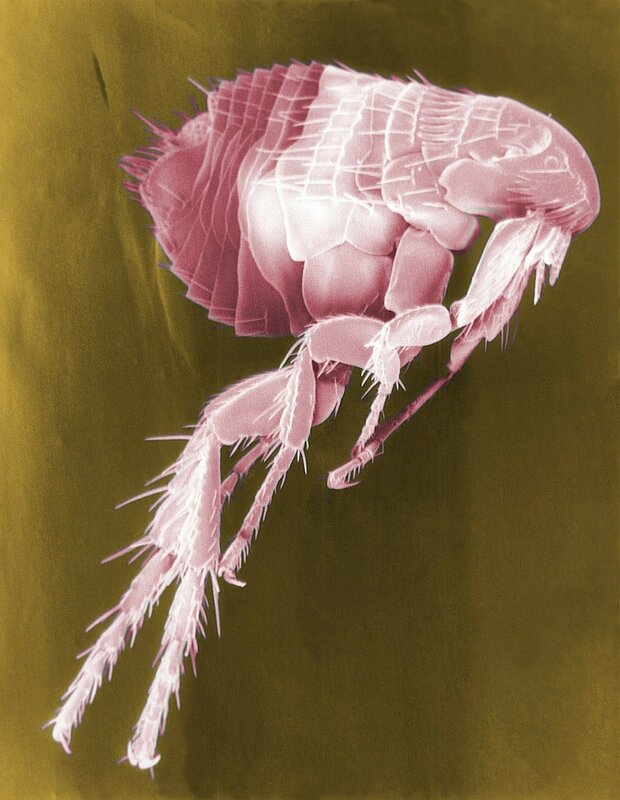 Keep an eye out for fleas and ticks, especially if you are out hiking or camping in the woods. And if you want to know if a waterless bath works, check out our dry dog shampoo advice here.